Although released, GTW has been given a lead which suggests that Wolfman was actually that little bit more gruesome, with an animated version that seems to have never seen the light of day. The actual released version had static images throughout, but an animated version was apparently done which had a censorship certificate stuck to it due to some rather odd video censorship laws (Being a 18 sticker). Didn’t the static version have this as well though? "Wolfman had no animation by the conventional sense which may be leading to some confusion or higher expectation – At the time of our/my first certified game Dracula (cert 15) Clem fought hard to gain a certification from the BBFC (British board of film classification) as the very idea had not been considered by them before. The BBFC were reluctant to issue a certification on the grounds that their current statute specifically mentions that to qualify under their remit the ‘image’ must be animated. 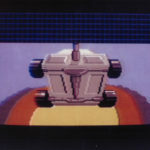 Although the actual reasons behind the BBFC’s decision may have run deeper, the reasons given for rejection (twice rejected in actuallity) were a simple solution away – as the c64 was not up to film-like animation and as the victims were dead therefore should not animate – so the solution came in the form of dripping blood c’est voila! animation. As we both know ‘dripping’ blood was still a long way from the c64’s capabilities, so bloodied areas of the image were overlaid with sprites that would x or y-flip to give the illusion of the highlight of the blood was twinkling in the moonlight. All versions of Wolfman that were developed were released – including a version for the German market where red blood was banned by law and was re-developed with GREEN blood instead as were Dracula (the first cert 15 game) and ‘Jack the ripper’ (the first cert 18 game) too."